A tweet between lovely and recently lovely star actress, Yvonne Nelson and popular kumasi - based actor, Lil Win, was bound to attract attention beyond the twitter sphere.
" it's official i love ' lilwyn' the actor.. he's funny. Geez," from Yvonne and Lil Win replied " am luv you paa. i say i marry u" the attention was bound to be considerable. Most people who read the tweet between Yvonne and Lil Win last week interpret it as the start of good relationship between english speaking actor and Twi speaking type are considered snobs who look down on their Twi counterparts. 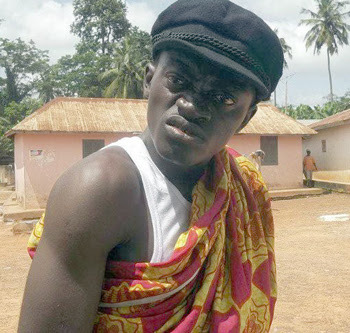 But when showbiz called Lil Win, real name, Kojo Nkansah, last Friday to find out how he felt about his " new relationship" with Yvonne, the "Azonto Ghost " star rather expressed surprise at the questions. "Who is Yvonne Nelson? " he asked, " And who said I am in love with her? I have not anything like that and I don't even know anything about that tweet you are talking of.
" I am very sure it is someone who is using my name to do that. I don't know anything about all the twitter you are talking about. Tell me, what they do there?" he asked. Lil Win said he had never Facebooked, Tweeted or Skyped before, I'm just not into those internet activities so I don't use them. He told showbiz that the first time he heard about Facebook, someone had impersonated him on Facebook to solicit for funds. "This Yvonne issue you are asking me, I am sure it is somebody who did that.